The redirects management tool helps you to keep your site healthy and running smoothly. Whether you’re cleaning up pages on your site or changing your site, chances are you’ve had to delete posts or pages. While it’s great you’re cleaning up your site, this comes with a risk of a visitor coming across a “404 Not Found” message. These errors come up because you deleted a page without redirecting that page to another. To solve this problem, you can use our plugin to add and import links to redirect the old URL to a new URL. You can begin setting up your website redirects from the “Redirects” tab on your navigation bar. You can manually add a new redirect from a 301: Permanent Redirect or a 302: Temporary Redirect. Simply enter the command and then select “Add New Redirect” to save. You can also edit a redirect from this screen by clicking the pencil icon. Here you can rename the type, title, and page for the redirect. To delete a redirect, click the trashcan icon and confirm the deletion. You can also import or export redirects from the second tab labeled “Import/Export.” To import your redirects, download this template. You also have the option to ignore or replace duplicates or replace all of your redirects all together. 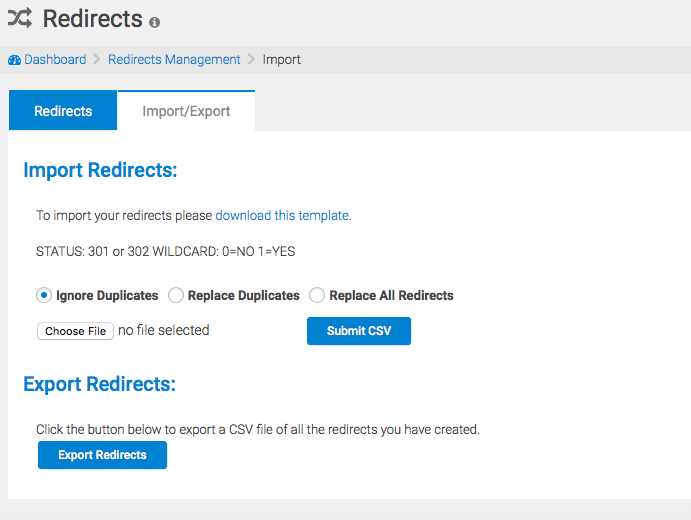 To export the redirects you’ve created, simply click the “Export” button to export a CSV file of your redirects. To set up or disable auto redirects, visit the Settings tab and simply check or uncheck the box below. To save your settings, hit the “Save Settings” button at the bottom of the page. Want to learn more about broken links and why they matter in terms of SEO? Read this!